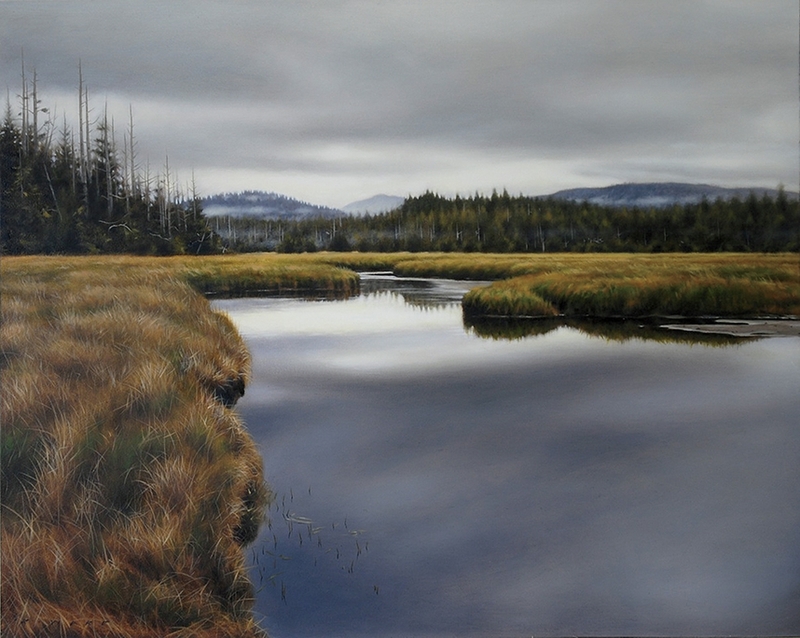 Ray Ward’s landscape paintings celebrate the ever-changing skies and moods of the West Coast. NANAIMO-BASED LANDSCAPE PAINTER Ray Ward has a data storage problem. At its root is his interest in capturing the constantly shifting light, the banks of fog and mist, and myriad cloud formations that advance and retreat daily across Vancouver Island. Along with images of land and shore, “I’ve got a sky folder that grew into about ten subfolders for different types of clouds,” he says. “I’ve got cumulus, I’ve got storm clouds, I’ve got backlit cumulus, I’ve got evening cumulus, morning sky, all different times of the day, and different varieties of clouds,” he lists with a lightness in his voice that suggests it’s not such a bad problem to have. Thank goodness for digital cameras, though. It wasn’t that long ago that Ward would paint in a darkened room, his easel in an umbrella of lamplight, slides projected on the wall for reference. “The quality of the slides was just so much better,” he explains, until about 2009, when digital resolution was fine enough to provide the detail he required. That’s not to say Ward’s landscapes are photo-realist. They are equally concerned with a mood conveyed with atmospheric perspective, the particular quality of light at a particular moment in time, resulting in an experience of landscape that is both visual and visceral. 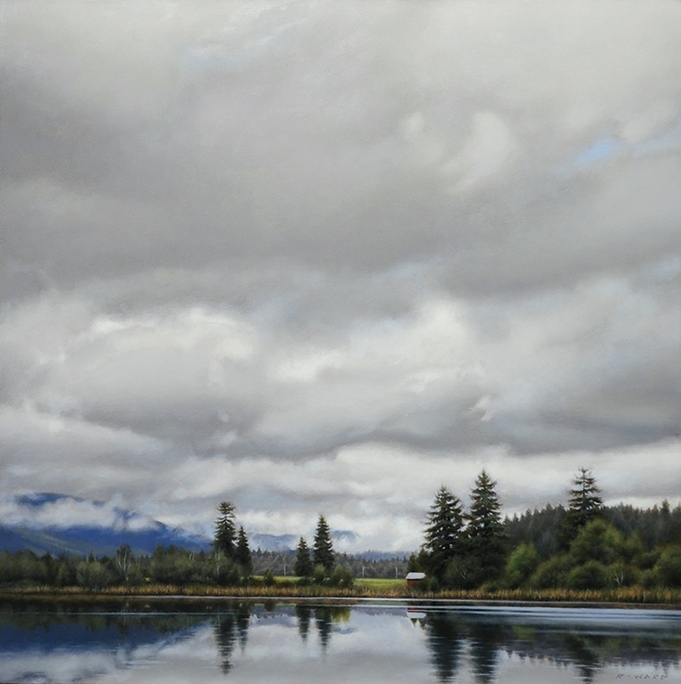 In the oil on board painting “September Reflections, Cowichan Valley,” the mist practically dabs at the viewer’s cheek. The overcast sky comprises the majority of the picture plane, with soft clouds settling in on distant hills. The moist air and diffuse light softens the edges of the trees just so, and the slightly rippling pond is foregrounded in such a way that the viewer is placed firmly at its bank, present and involved in this specific moment. It is a typical early fall day, made special by its singling out in time. Ward is particularly attracted to cloud formations because of their ephemeral nature: “I like the way [they] can change a landscape so fast—when a storm front moves in and it looks completely different. I like the challenge of getting the subtleties. On an overcast day, it is more challenging than on a bright sunny day: you don’t have the contrast, the obvious value shifts between the lights and the darks. Everything is more in the middle. When you can get it right, it’s pretty rewarding,” he says. This appreciation may stem from what sounds like an idyllic childhood spent largely outdoors. 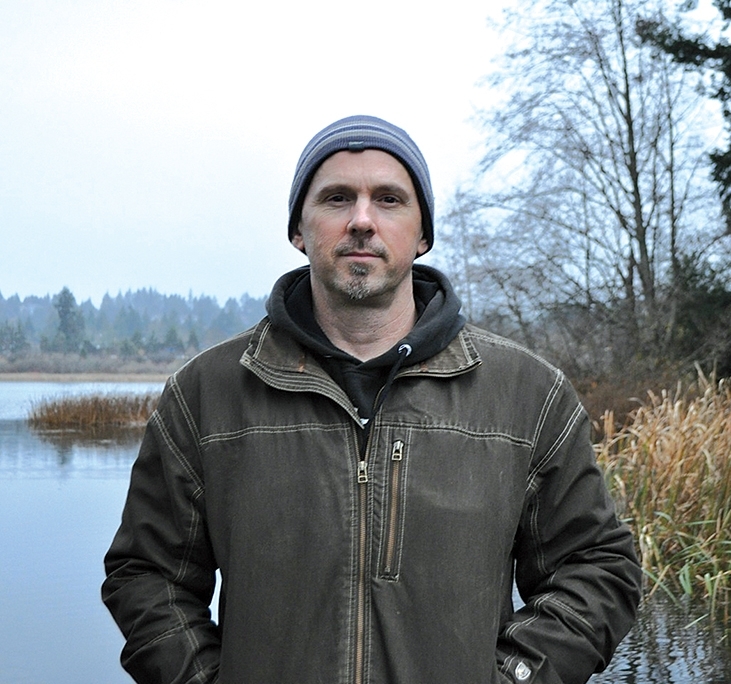 Ward was born in Comox in 1968 and grew up on his family’s five-acre hobby farm in Courtenay. “We had cows and chickens, pheasants, ducks and geese, all sorts of things,” he says. “It was a good way to grow up.” He also enjoyed drawing as a child, and was encouraged by friends and, at age 11, winning an art contest in a local paper. After hearing that a friend’s uncle had made a living thus, Ward decided to pursue a career as an illustrator. He entered the Illustration and Design program at Capilano College (now University) in North Vancouver when he was 20 years old, and upon graduation found an agent. This was the early 1990s, when the illustration field was transitioning to digital, which held little appeal for Ward. He freelanced for about a year, continuing to pay the bills with landscaping and stonework, a job he’d had while in school. “My end goal was always to be a fine artist one day, but I thought it would be a lot later,” Ward admits. Needing to adapt his plan, he began to paint in the evenings. Days spent hefting stones and building walls were followed by nights lifting brush to canvas. He started showing work at a gallery on Granville Island in Vancouver and sold his first painting there, a seascape, in 1995. Around this time Ward and his wife Heidi were also travelling extensively. They spent time in Australia, Malaysia and Thailand, saw Komodo dragons on the island of the same name, and travelled in Europe. Another trip took them to Central America, and they made multiple trips to France and Italy. Ward was taken with the light, colour and architecture of Venetian street scenes, and those were what he projected onto his darkened walls in his earlier studio work. The scenes sold well in the galleries who began representing him, and he painted several iterations of them. 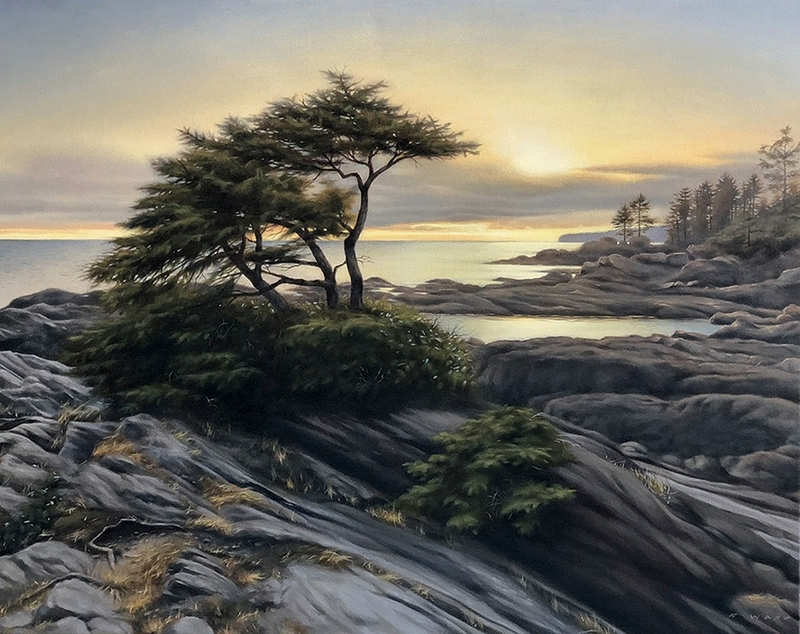 However, when he and his wife moved to Nanaimo and he began painting full-time in 2004, Ward found his interests shifting toward his immediate environs. Walking his dog around the many trails near their home and visiting the west coast of the island provided Ward with endless inspiration for his painting—and a sense of urgency to capture landscapes that seem to be constantly usurped by development. Recently Ward’s family, now including a young son, travelled to Alberta and Haida Gwaii, where he gathered more images from which to paint. Ironically, the sun was high and bright for most of his visit to Haida Gwaii, while the mountains were shrouded in low cloud in Alberta—“You could only see the bottom quarter at Lake Louise,” he laughs, but he still found plenty to further stretch his computer’s capacity. He will approach these compositions as he typically works. “I still do thumbnail sketches most of the time and work out the composition that way, trying different things, eliminating distracting elements.” he says. Once satisfied, he will do a simple drawing on board or canvas. He prefers the former for its smooth surface, which best supports fine detail, and its flexibility in size and shape. Next he applies oil paint in thin layers. Each begins with a preliminary wash in an earth tone. “I have never liked working off a white surface; I like to see a little bit of the background throughout when I am painting,” he explains. “I can adjust the values, the temperature off of that.” After blocking in the scene, he continues, “I just start going over layer by layer, usually three to four layers, just finishing it from the background to the foreground.” Because each layer of paint takes at least a day to dry, Ward works on several canvases at once—usually around four or five, but recently up to 15, in the crowded outbuilding near his house. Despite his productivity, he has another problem: supply and demand. “I was trying to get ready for another gallery and I would get a bunch [of paintings] finished, then one of my other galleries would want more work, so I would have to dig into those,” he laughs. But really, it shows that a wider public shares his fascination with our capricious skies. This, like finding digital capacity for images of infinitely changing cloudscapes, is a good problem to have. Ray Ward’s paintings can be seen at Peninsula Gallery, 100-2506 Beacon Ave, Sidney, 250-655-1722, www.pengal.com. Find him online at www.rayward.ca. While she tries to keep up with her growing family, Aaren Madden continues to learn and be inspired both personally and professionally, aware that she has many good problems to have.